The information on this page is for downloading x_cpu.exe for Visual LANSA V14. To download a V13 x_cpu.exe, click here. 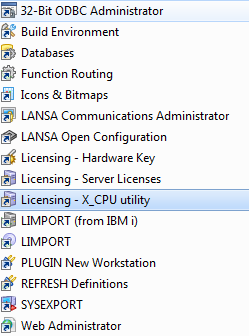 To obtain CPU information for LANSA on IBM i, click here. A LANSA license code is only valid for a PC for which it was requested. The PC is identified by its CPU serial number and model. A special utility, x_cpu.exe, is provided to display this information. This executable is shipped as part of the Visual LANSA installation and can be accessed from the LANSA folder from the X_CPU utility option. A V14 license request must be accompanied by the CPU details as generated by a V14 version of X_CPU.EXE. The V14 X_CPU.EXE is available for download from this page for situations where a full Visual LANSA is not yet installed on a PC, for example, for a Proof of Concept or for a Windows production server that won't have a full Visual LANSA installation. Note: Your company policy may enforce restrictions on downloading certain files, including zip file and executables. Once downloaded, the x_cpu utility can be run from any location on your hard drive. The generated x_cpu_<model>_serial nunber>.txt file will be created in the same location. You will be prompted to show the file in the saved location. Tip: We recommend that you save the x_cpu.exe to the Visual LANSA Tools directory, if you have this directory and if the x_cpu.exe doesn't exist in this directory already.